OK, after all that cheese in Switzerland, I’m on a bit of a health kick. I loved the Swiss cheese but there’s only so much cheese a girl can take and still feel good. I’ve been thinking for a while of buying some of the lovely fresh beetroots around at the moment to make a dip and it’s taken me till this morning to do it. 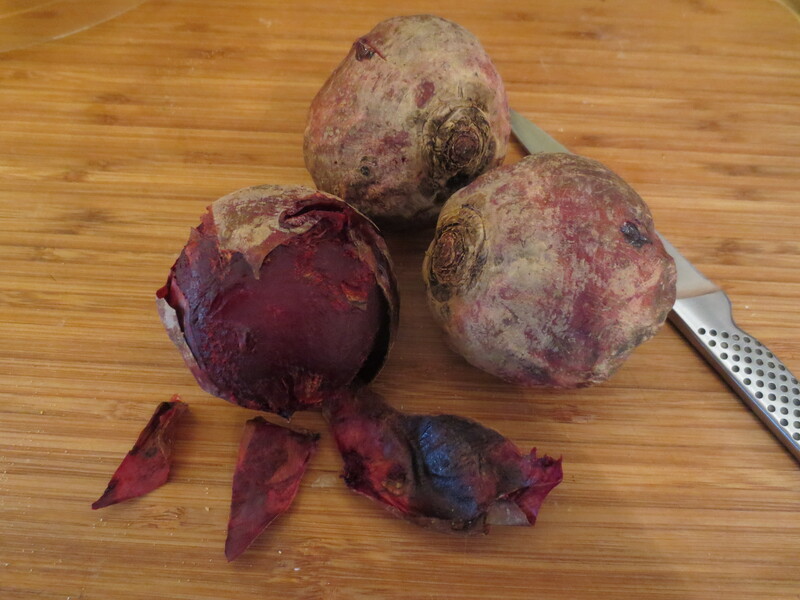 I picked out three nice firm beetroots in the supermarket. 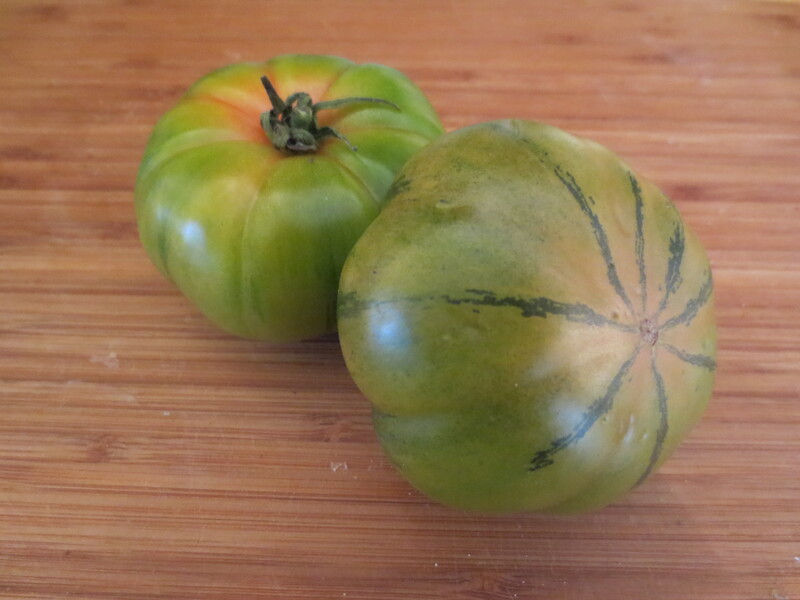 I also bought some Marmonde beefsteak tomatoes, which looked pretty and Waitrose told me were ‘harvested green for full flavour’. To be honest, I think they could have done with some more ripening, but mixed with nicely ripe and full-flavoured tomatoes I already had at home, they made a nice salad dressed simply with olive oil, cider vinegar and seasoning with a few whole Greek basil leaves scattered on top. 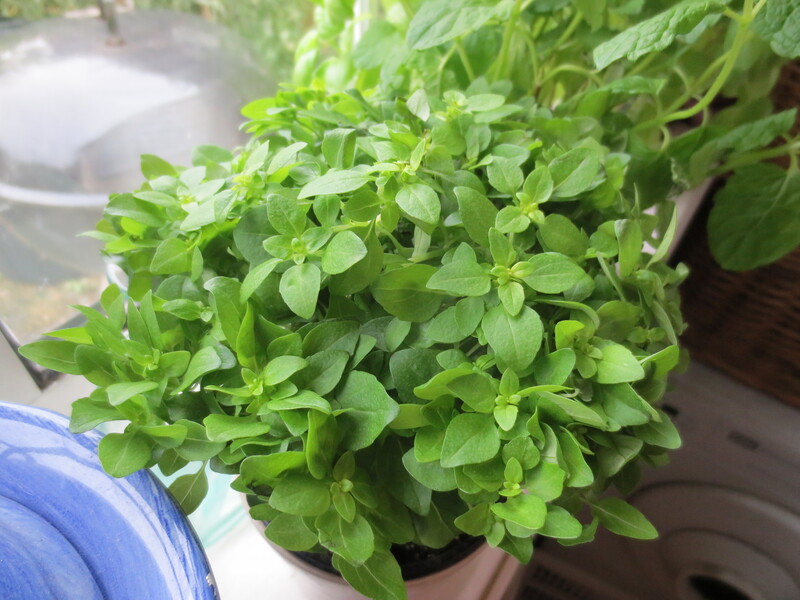 I couldn’t resist buying the Greek basil plant for a hint of summer in my kitchen (I am definitely not a winter girl!). 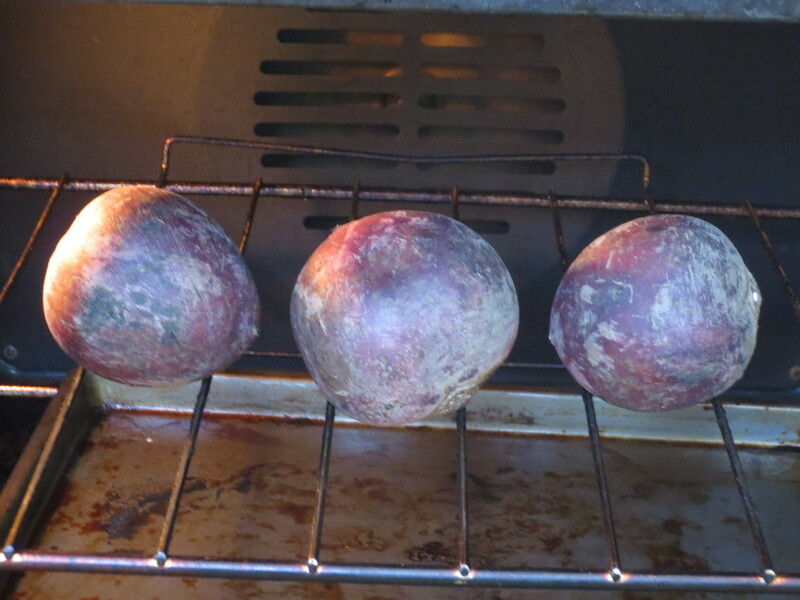 Baking the beetroots takes a lot more time than cutting them up and boiling them, but the taste is infinitely superior … and really, we’re only talking a little more time here rather than any more effort. I gently scrubbed them to clean them. 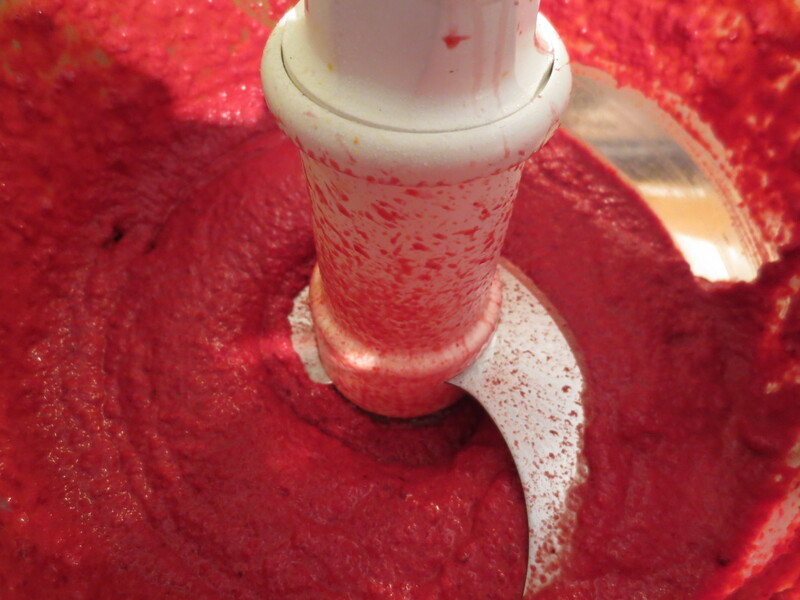 It’s really important not to pierce the skins so that some of the red juices and flavour seep out. I baked them at 200 C/180 Fan for about an hour. They smelled wonderful as the cooking time went on and I returned to the kitchen to see how they were doing. I tested them by pressing them gently (with an oven glove to protect my fingers!) and it was only once I was fairly certain they were cooked that I did a final check with the end of a small sharp knife pierced in to see if they were tender all through. Then it was an easy job to peel away the skins. 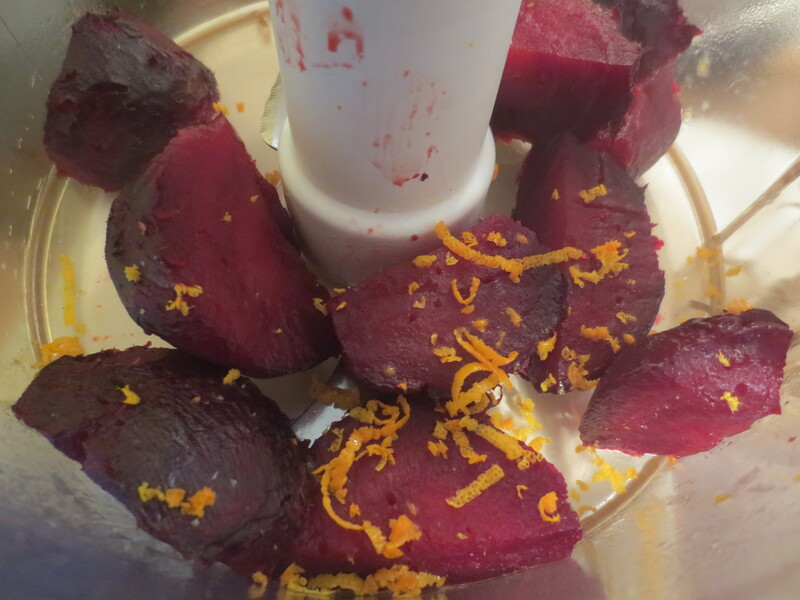 I quartered the peeled beetroots and put them in a food processor. I then used my zester to add some orange zest. The orange idea was a spontaneous one; I just suddenly thought to do it. But I have to also confess that it’s not my idea but because I remembered buying some wonderful beetroot and orange salad at A Cena on the Hill one time. Then I added 6 tablespoons olive oil, 2 tablespoons tahini, 2 tablespoons cider (or red wine) vinegar, salt and pepper. I then whizzed it all into a smooth and creamy consistency. Remember to check the seasoning. I transferred it to a bowl, drizzled a little more olive oil over the top and sprinkled over some chopped fresh mint. 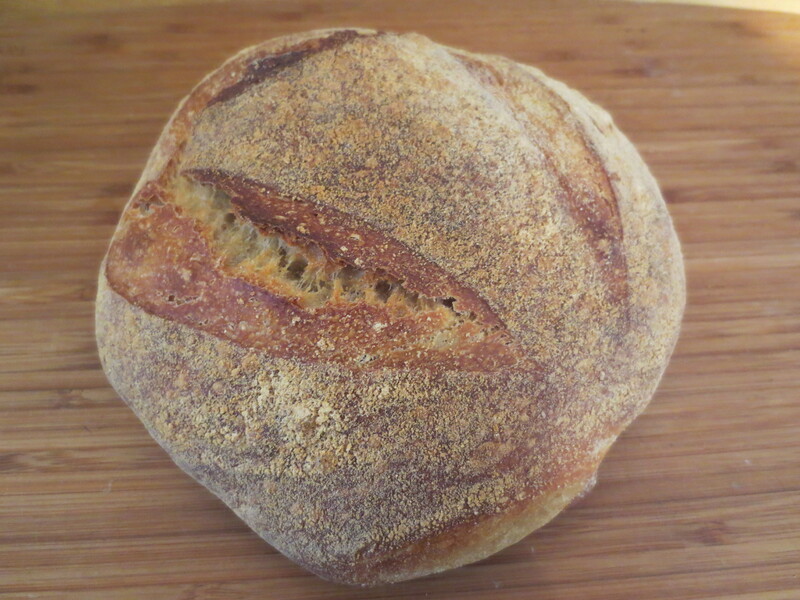 I’d bought a wonderful loaf from Ruben’s Bakehouse, a brilliant new artisan bakery in Twickenham – I’m going back next week to do a whole post on it. 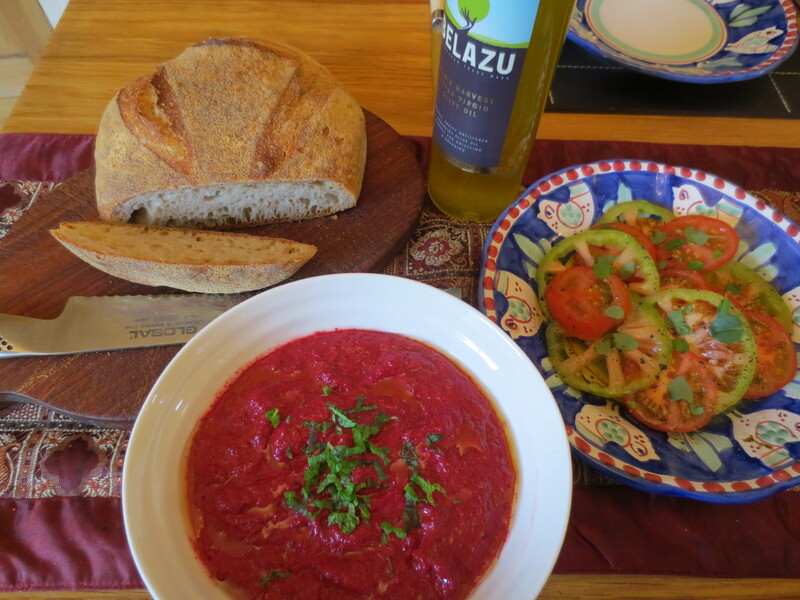 Then the beetroot dip, tomato salad and bread went on to the table for lunch. It was a gorgeous lunch. 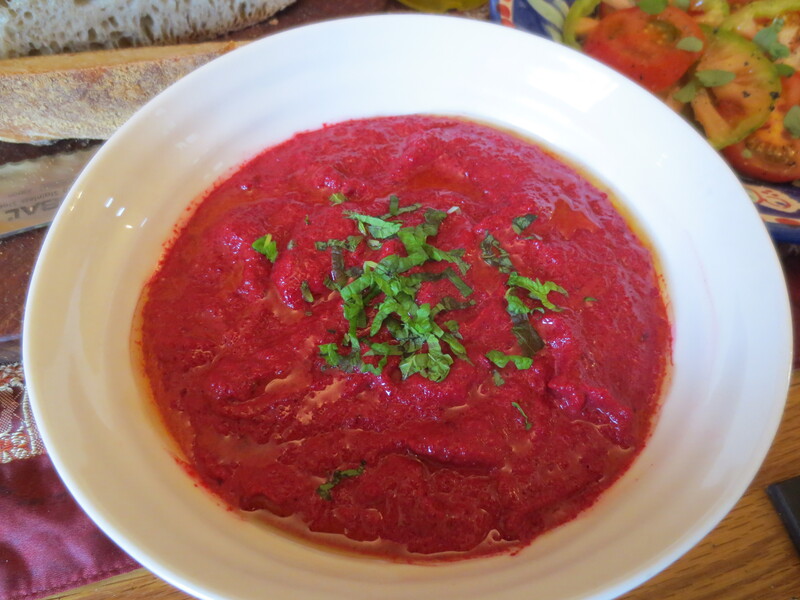 I love the sweet earthiness of beetroots and the baking gives even more depth to the flavour. The orange zest added a distinctive but lovely sweet citrusy edge to the dip. I simply spread it thickly over the wonderful fresh sourdough bread – still warm when I’d carried it from Ruben’s an hour or so earlier. I didn’t need any butter or oil on the bread. 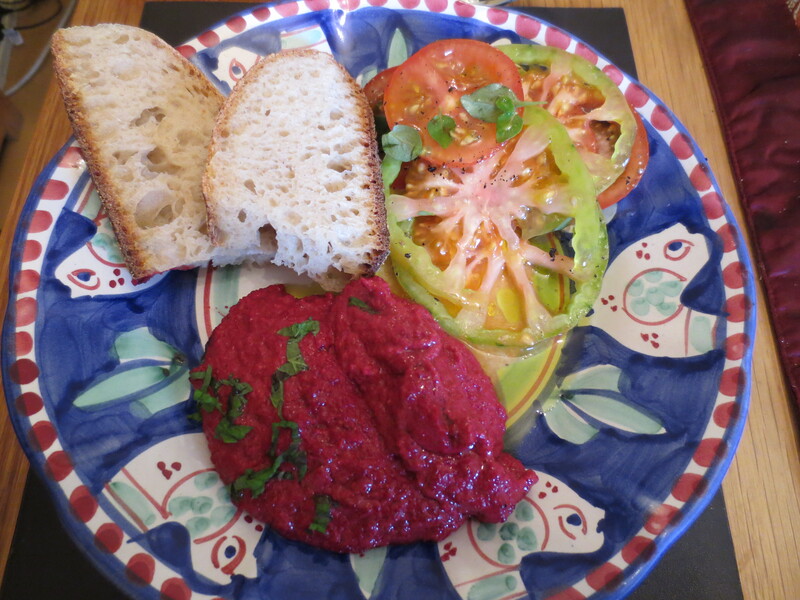 The tomato salad wasn’t necessary – it was just that I hadn’t been able to resist those tomatoes! – but they added a nice freshness to the whole meal. A delicious, healthy and satisfying lunch! Your dip sounds terrific as does your entire lunch. This looks incredibly healthy and delicious. The orange zest sounds intriguing with the dip and scrumptious. Thank you, Judy. It was good! I think the orange works well. Thank you. I was really pleased with it.